The Certificate of Origin is required by some countries for products exported from the United States. In many cases, a statement of origin printed on company letterhead will suffice, but exporters should verify whether a Certificate of Origin is required with the buyer. If the country you are shipping to requires a Certificate of Origin, the Southfield Area Chamber of Commerce can help. Chambers are used as trusted partners all over the world for Certificate of Origin assistance. The role of chambers of commerce validating certificates of origin can be traced back to the 1923 Geneva Convention, relating to the Simplification of Customs Formalities. 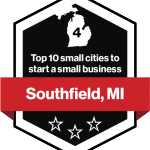 The Southfield Area Chamber has been validating certificates for 20+ years. If your shipment requires a Certificate of Origin, one original is required. The descriptions and amounts on the Certificate of Origin must be consistent with those entered on the Commercial Invoice. Most countries accept a generic Certificate of Origin form that includes the following information. 1. The shipper's name and address. 2. The recipient's name and address. 3. The product's parts or serial numbers. 4. The number of packages, boxes or crates in the shipment. 5. The gross and net weight of the shipment. 6. A complete and accurate description of the contents of the shipment. 7. The country of origin of the contents of the shipment. 8. The completed Certificate of Origin must be validated and notarized by a local chamber of commerce. Call the Chamber office (248.557.6661) to arrange a 15-minute meeting. The first 12 certificates are free to members, with $20 per certificate thereafter. For non-members, each certificate is $40.